Arthritis in hands or hands arthritis is known also as MP joint arthritis. It affects the larger joints within your hands literally at the bottom of each finger and your thumb where they meet with the hand. These are very important joints which allow you to pinch and use a power grip, acting like hinges. 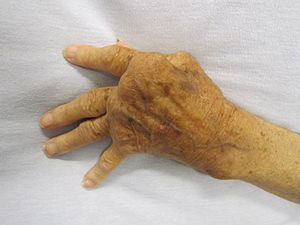 However, this type of arthritis is very rare in comparison to arthritis in the other joints of the fingers and thumbs. Arthritis in the hands is quite often rheumatoid, where the synovium or joint lining produces factors in the form of chemicals which cause the destructive inflammation of tendons, ligaments, other soft tissues and cartilage. The resulting situation is that your joint surfaces are completely destroyed, forcing your fingers into what is known as an ulnar-deviated type position, whereby the begin to point towards your smallest finger. However, under other conditions, though rare, this arthritis can cause the complete loss of motion, deformities and extreme pain. Anyone who has injured the joints in these areas will gradually experience a lessening of the presence of cartilage around those joints, known as post-traumatic arthritis whereby the joints gradually become more stiff and progressively more painful. Other factors can include osteoarthritis of the middle, index and thumb digits. So, how is this arthritis treated? If the arthritis is rheumatoid, doctors will give out medicines that cover the pain and reduce the destructive damage being done with cortisone injections into the affected joints. If the arthritis is trauma related, splints, variations in activities and anti-inflammatory medicines will be given. If the arthritis is the progressive type, and it is severe enough, surgery may be recommended. If the joint surface has been sufficiently destroyed through rheumatoid arthritis, some patients are treated using synovectomies, whereby the synovium is taken out and the tendons and ligaments are re-aligned and/or tightened to help with better function and to prevent the destruction process of what is left of your cartilage. If the destruction of your joints is so extreme and severe, some people get joint replacements or have their joints fused. Many joints function reasonably well after this, but joint replacements are preferred in preference to fusing because some joints become completely disabled and lose complete mobility.